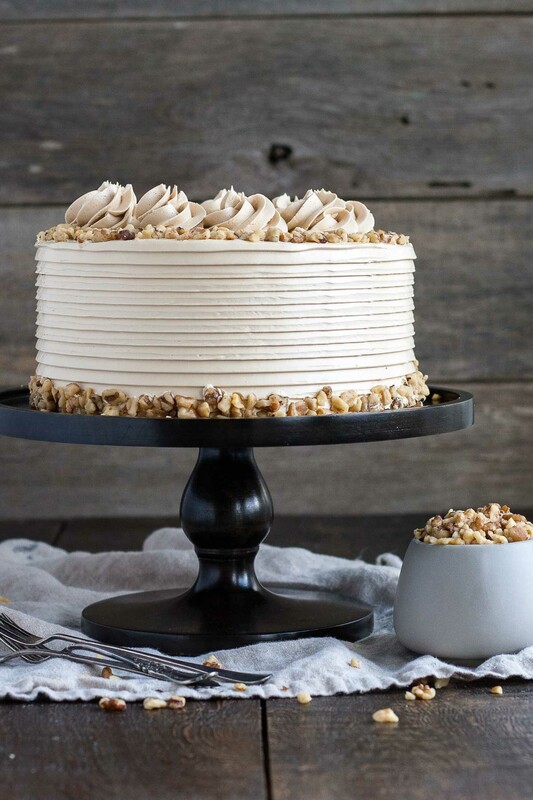 This toasted walnut cake with brown sugar buttercream is the perfect cake for the holidays. 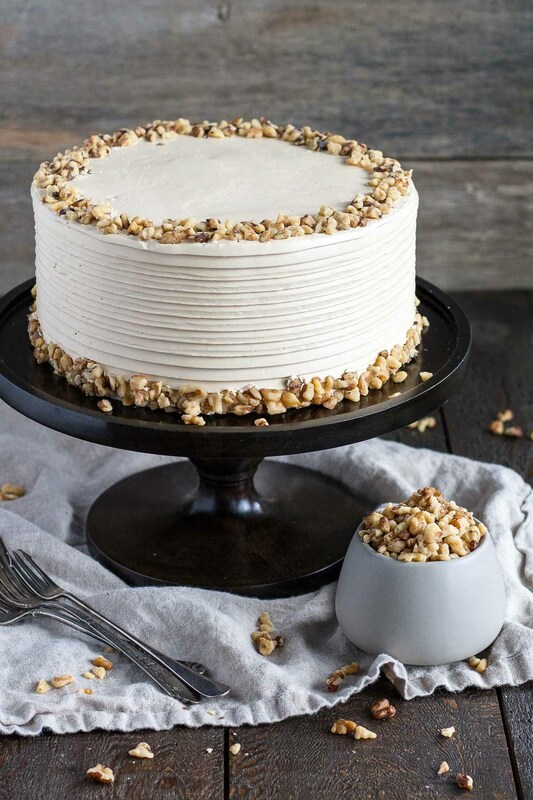 In typical Olivia fashion, this is not the first version of this Walnut Cake. 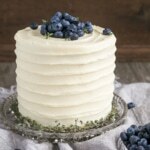 If you’ve been reading along with Liv for Cake for a while, you’ll know that more often than not there is a fail of some sort or some self-imposed desire to redo things and make them perfect. 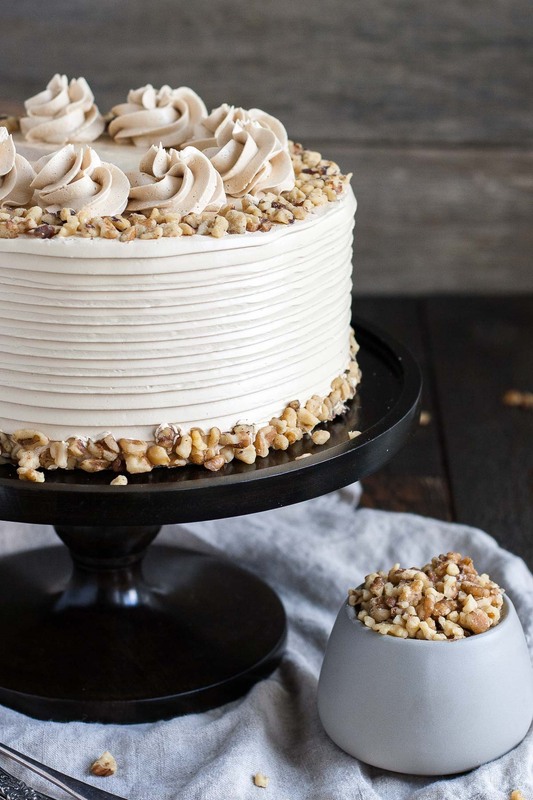 There was an unplanned twist (literally) with this walnut cake that was never intended to be there. Or, at least, wasn’t part of my original vision. I had finished this cake, taken pics, cut into it, and then decided to use up the rest of the frosting and make rosettes on the top of it. I didn’t care what they looked like, I just did them quickly and haphazardly so I could move on with cleaning the giant disaster of a kitchen, not to mention my photography room. So off I go, piping the rosettes and UGH, I frikken loved how it looked! Dammit. Did I mention I had already spent the better part of an hour taking pics AND ALREADY CUT OUT A SLICE OF THE CAKE? FML, seriously. The cake just looked so much better that I had to go take pics again and attempt to “hide” the fact that there was a giant wedge of a cake slice missing from it. Stress life! As such, I could only get so many angles, but I still preferred it to the original. Still super pretty, right? Clean and simple. I really don’t mind it, but the rosettes just added a bit more pizzazz and really took the cake from pretty but plain to something more stunning. The rosettes are not my best work. I literally powered through them just to use up that frosting! Had I known I’d actually be taking pics of them, I would have made sure to finish the tops off a bit cleaner. Had I planned this all along, I might have even popped a half walnut piece on top of each rosette. 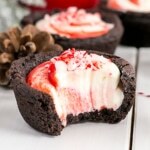 Some ideas for you to try if you make this one! I used a decorating comb for the sides of the cake. I’ve had this decorating comb for 7 years and I think this is the first time I’ve ever used it! I don’t know why… maybe because when I think of it I picture a grocery store cake? Not sure. 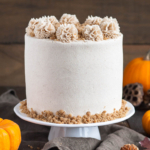 At any rate, it was a crazy easy way to add a pretty finish to the side of the cake, and I will definitely be using it again. It’s a miracle that I was able to retake the photos given that I’d cut a piece out already. You can kinda tell in one of the pics, but I’m hoping that’s only because I told you about it. Another lesson learned — rosettes make everything better. 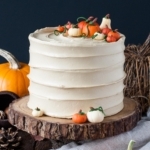 Decorating drama aside, let’s talk about how amazing this cake tastes! 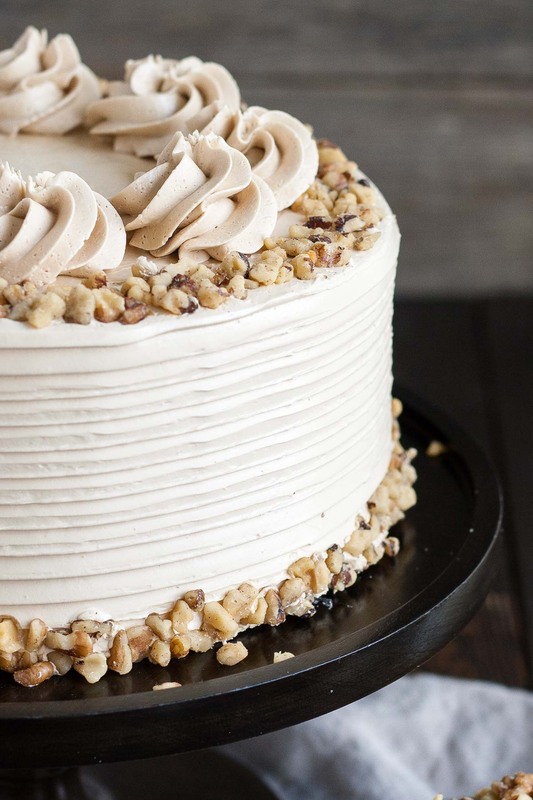 It is very unassuming — I get it, a walnut cake isn’t that exciting, but let me tell you: one slice won’t be enough! 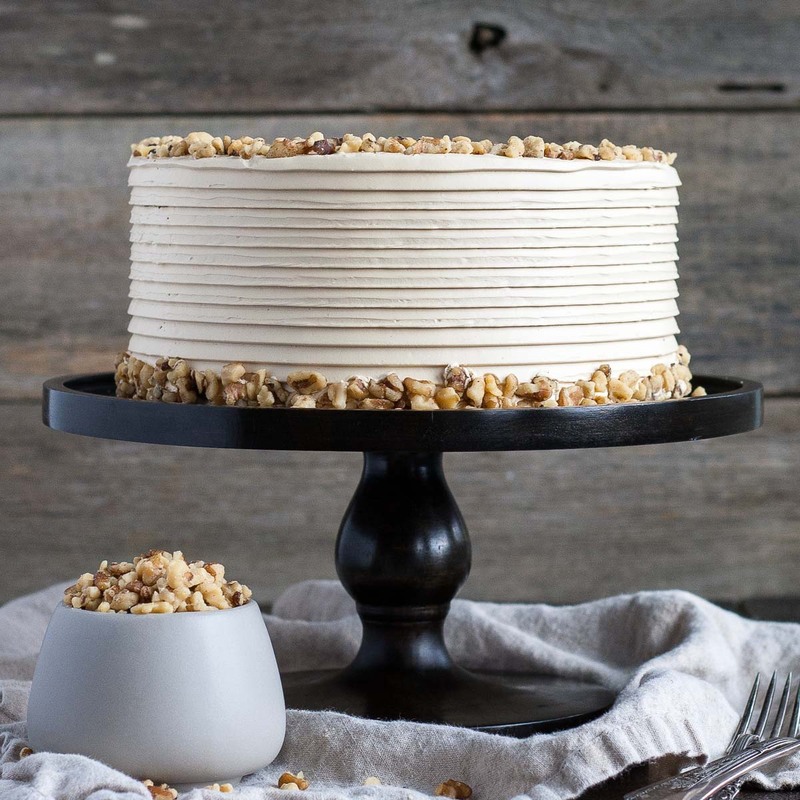 I added a hint of cinnamon to the cake, which pairs really well with the walnut. 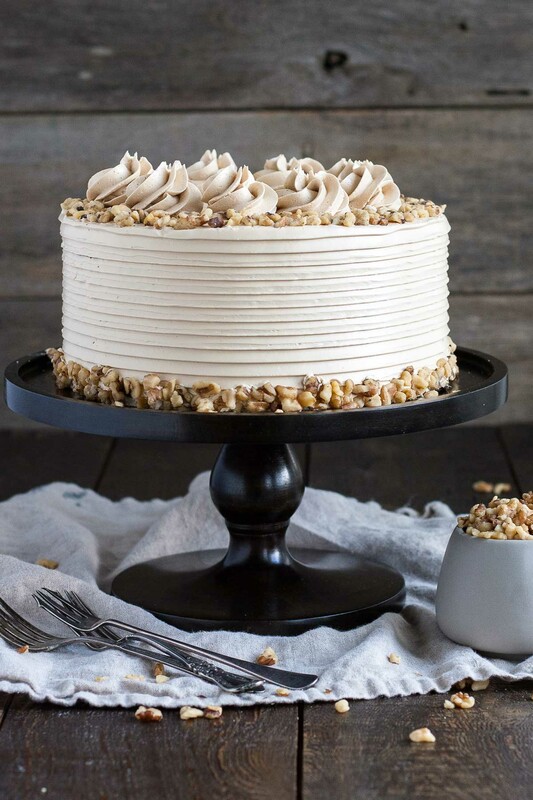 And that brown sugar Swiss meringue buttercream? That’s a keeper. I’ll be making that one again for sure! 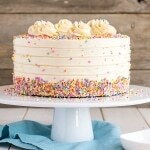 Head on over to The Cake Blog for the recipe! I tried the walnut cake recipe and my cakes didn’t rise. I added all the ingredients and cooked them just as the recipe said. Hi Joanne! Did you check to make sure your baking powder isn’t expired? I’d like to be on your mailing list. Hi Virginia! I have added you to my mailing list. 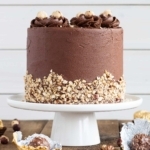 Hi Olivia, wow I just browsed through your beautiful amazing cake recipes…And I’m in aw!!! Seriously I’ve got to try one of your recipes in this month. 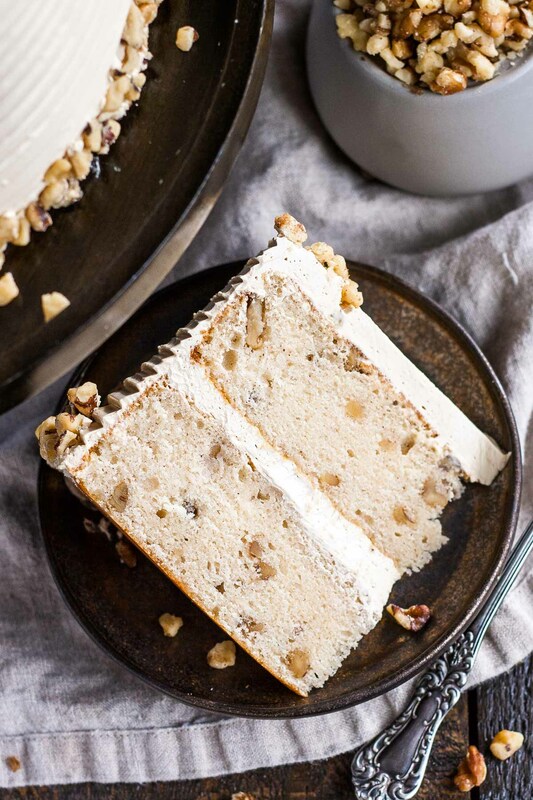 Caramel apple cake looks amazing too…. Thanks so much Priya for such a sweet comment! Hi Zenia! A Swiss meringue is simply warming up with egg whites and sugar before whipping. I recommend not skipping this step! 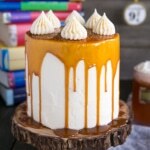 This cake–WOW!!! The flavors in it are calling to me and I am not even a cake person! Olivia, Your cakes are so amazing. But I bet you already know that. I can’t imagine how you ever have a cake “fail.” I’ve never had the urge to run out and buy a cake comb before but now … 🙂 Needless to say, they always sound delicious too. You are so sweet, thank you Laura!! 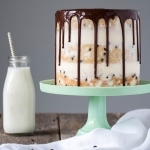 The cake comb is a super easy way to finish off a cake. I don’t know why I don’t use it more often! I absolutely think walnut cake is exciting! It looks gorgeous with the rosettes and without, and I HAVE to try this recipe one of these days.